My mother has dementia, not Alzheimer’s. At least not yet, since Alzheimer’s can’t be determined until someone passes away. I’m of the opinion that my mother has dementia because she was stressed most of her life, a lot of that before I came around. I know few of the details of what gave Mom stressed before I was born, and there’s no one to ask anymore, so I can only talk about that which stressed her once I was born. She worried about me, her only child, and continued worrying about me throughout her life (even when I didn’t need it) until she couldn’t worry anymore. 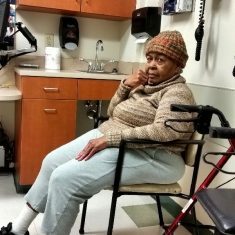 She worried about my grandmother, who caught cancer four times, beat it every time, but the last time made her extremely weak. She worried about my dad as he was in the military, and it turns out with good reason. I just found out a few months ago that he’d actually been shot in both Korea and Vietnam; she didn’t know him when he was in Korea but did while he was in Vietnam. She always worried about holidays and special events, and even though she was always a trooper, she never enjoyed any holiday until probably the late 90s. Even then, I’m not sure if she actually enjoyed the holidays or acted like she did because Dad was sick at the time. I can’t say that Mom never had any good moments, but stress was always there. Stress is a major cause of dementia; if you’re feeling it try to find a way to reduce it. Because of this stress, Mom’s sleeping pattern has always been erratic. She’d go to bed early, mainly watching TV, but she never slept that well. I share that same pattern, although my sleep has improved over the last few months. In Mom’s case, it started to take a toll on her to the extent that she was tired all the time and didn’t move around all that much. She pretty much gave up on cleaning the house or doing almost anything that didn’t involve her hair or Wegmans. When I finally had to move my mother to live with me in January 2017, I asked her doctor if she would prescribe something to help her get to sleep. I knew that while she was living with herself she probably wasn’t sleeping all that much, but we needed her to try to sleep through the night. A doctor prescribe something called Seroquel, and we went with that. Of course the Seroquel didn’t work. I have no idea why it didn’t work, at least at the time I didn’t. I also didn’t know at the time that one of its side effects was increased mortality in elderly patients with dementia-related psychosis; and suicidal thoughts and behaviors; that sounds pretty horrible, doesn’t it? Luckily, it never brought this on for her, but it still didn’t work. Almost a year later, when Mom had both a new doctor and had visited University Geriatricians here in Syracuse, it was recommended that she switch to something called Trazodone. Over time, things started to happen. First, Mom’s sleeping pattern didn’t change all that much. It was recommended that we increase the dosage, which we did, but that was almost immediately problematic because it made her catatonic. I couldn’t move her on my own because she couldn’t move herself, and needing people to help move her, as she’s not a small woman, wasn’t going to work. The next thing to happen was Mom started getting depressed, surly and mean. She started talking about wanting to commit suicide in to die. She almost never laughed or smiled, except during parts of certain movies. 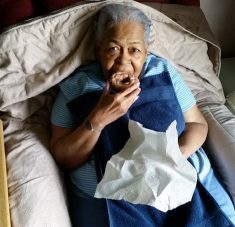 My wife and other people who are more familiar with the elderly said her behavior was just a condition of her disease. I had a different take on it. I’m in natural researcher, and I thought it was time to look deeper into the medication. The conclusion I came to is that it was the Trazodone that was giving her all this trouble. It turns out that most of the sleep medication that’s given the people is actually for depression. And one of the strange side effects of medication for depression is worse depression and thoughts of suicide. I don’t quite understand that, but it seems to be a reality. In this case there was the same warning as with Seroquel; side effects are increased mortality in elderly patients with dementia-related psychosis; and suicidal thoughts and behaviors; ugh! Just to throw this in there, Mom’s doctor prescribed Zoloft to try to help her sleep. That lasted two days; Mom had serious diarrhea, and there’s absolutely no fun in cleaning that up all the time! Another reality my research came up with was that the sleeping pattern of a lot of elderly people is the exact same sleeping pattern of my mother. They tend to want to sleep a lot during the day, and then have trouble sleeping at night. Since Mom’s always had this sleeping pattern, it felt silly for me to try changing her behavior by using medications that not only weren’t working the way the doctors hoped it would, but were changing her behavior. Without talking to her doctor first, I immediately stopped everything. I understand the concept of going cold turkey and how it can cause some problems with different types of medications, but in this case I figured it was a better thing to do than to keep pumping a medication that was changing her behavior into her system. My research indicated it could take anywhere from 48 hours to a month before I’d know what the results were from ceasing the medication. What happened was kind of interesting. Within a week I noticed a small positive change in Mom’s behavior. She still wasn’t sleeping that much, but she wasn’t angry 24/7 and that was a nice change. Within three weeks, Mom actually started giggling and was more playful; a major change in a positive direction! I also decided to tackle the sleep issue in a totally different way. I’d started taking something called valerian root, and it helped me sleep better. I actually started having dreams after not having any dreams for years, or at least not remembering that I’d had any dreams. Along with the valerian root I added melatonin and was already taking magnesium. Those seemed to work for me, so I decided to put Mom on it. It’s never going to be perfect with Mom. I understand that her health and her behavior in general is going to change over time. However, it’s so much nicer being with someone who’ll smile and laugh every once in awhile, moreso than her always being agitated. I’m not saying my solution will work for everybody. What I will say is that any time a physician prescribes anything for your parent or loved one who’s in your care, you should research it and ask questions as necessary. Especially with sleep medications, which I hadn’t done up front but I’m glad I finally did. We really can’t do anything but to have these pills as sleep aids to some of our elderly parents. But having enough sleep and some little exercise is really good for their body. Well… as you saw, I took my mother off the pills. She’s a much better person, even if her sleeping habits aren’t what I’d like them to be. Really good post and informative. My family is dealing with my father-in-law who has bounced between hospital, nursing home and home for the past three years. The nursing homes put him on all kinds of anti-depressants and had no good effects. At home, minus all the meds he’s slowly getting better. It’s an interesting game Phil. It’s easy to medicate someone but one has to be willing to pay attention and question the results. I hate that it took me so long to even think about it, but I’m glad I finally did. Have you tried any diet plans for her? Diet plans might help her to get better sleep. Not really. She’s limited in what she’ll eat (she taught me that lol), so I pretty much give her the same few things all the time. For instance, she’ll only eat honey nut Cheerios for breakfast, which she’s eaten for about 12 years.